Royal Dutch Shell plc (RDS-A): Are Hedge Funds Right About This Stock? Before we spend days researching a stock idea we’d like to take a look at how hedge funds and billionaire investors recently traded that stock. S&P 500 Index ETF (SPY) lost 13.5% in the fourth quarter. Seven out of 11 industry groups in the S&P 500 Index were down more than 20% from their 52-week highs at the trough of the stock market crash. The average return of a randomly picked stock in the index was even worse. This means you (or a monkey throwing a dart) have less than an even chance of beating the market by randomly picking a stock. On the other hand, the top 15 most popular S&P 500 stocks among hedge funds not only recouped their Q4 losses but also outperformed the index by more than 3 percentage points. In this article, we will take a look at what hedge funds think about Royal Dutch Shell plc (NYSE:RDS-A). Is Royal Dutch Shell plc (NYSE:RDS) a buy, sell, or hold? Money managers are selling. The number of long hedge fund bets dropped by 3 recently. 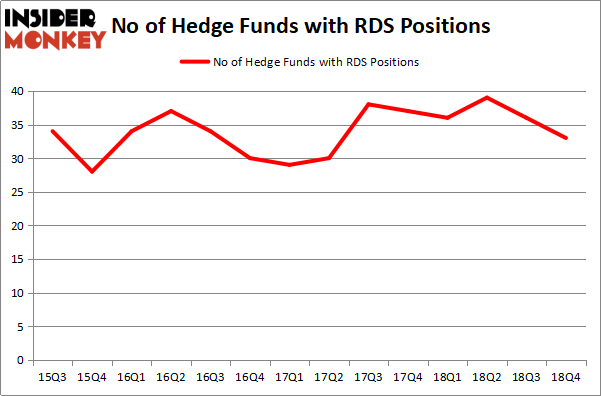 Our calculations also showed that RDS isn’t among the 30 most popular stocks among hedge funds. In today’s marketplace there are numerous formulas investors can use to size up stocks. A duo of the most innovative formulas are hedge fund and insider trading indicators. Our researchers have shown that, historically, those who follow the top picks of the top hedge fund managers can trounce the market by a solid margin (see the details here). We’re going to take a gander at the new hedge fund action encompassing Royal Dutch Shell plc (NYSE:RDS-A). How are hedge funds trading Royal Dutch Shell plc (NYSE:RDS-A)? Heading into the first quarter of 2019, a total of 33 of the hedge funds tracked by Insider Monkey were long this stock, a change of -8% from the previous quarter. On the other hand, there were a total of 36 hedge funds with a bullish position in RDS-A a year ago. With the smart money’s capital changing hands, there exists a select group of notable hedge fund managers who were boosting their holdings significantly (or already accumulated large positions). Among these funds, Fisher Asset Management held the most valuable stake in Royal Dutch Shell plc (NYSE:RDS-A), which was worth $739.9 million at the end of the third quarter. On the second spot was Pzena Investment Management which amassed $308.5 million worth of shares. Moreover, Orbis Investment Management, Millennium Management, and Two Sigma Advisors were also bullish on Royal Dutch Shell plc (NYSE:RDS-A), allocating a large percentage of their portfolios to this stock. Because Royal Dutch Shell plc (NYSE:RDS-A) has experienced declining sentiment from hedge fund managers, it’s easy to see that there was a specific group of fund managers that slashed their full holdings last quarter. 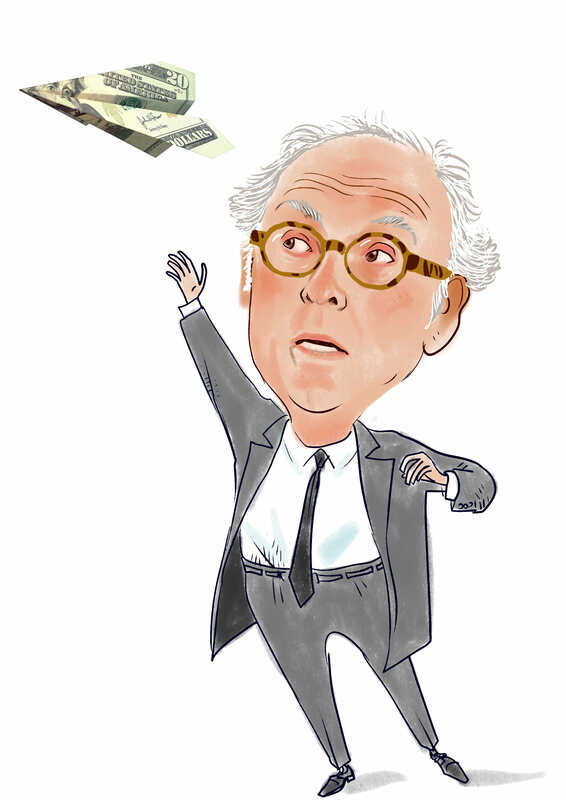 Intriguingly, Peter Rathjens, Bruce Clarke and John Campbell’s Arrowstreet Capital dropped the biggest stake of the “upper crust” of funds followed by Insider Monkey, valued at an estimated $454.9 million in stock. Steve Cohen’s fund, Point72 Asset Management, also dumped its stock, about $124.2 million worth. These bearish behaviors are important to note, as aggregate hedge fund interest was cut by 3 funds last quarter. Let’s now take a look at hedge fund activity in other stocks – not necessarily in the same industry as Royal Dutch Shell plc (NYSE:RDS-A) but similarly valued. These stocks are Pfizer Inc. (NYSE:PFE), Bank of America Corporation (NYSE:BAC), UnitedHealth Group Inc. (NYSE:UNH), and Verizon Communications Inc. (NYSE:VZ). This group of stocks’ market valuations match RDS’s market valuation. As you can see these stocks had an average of 75.5 hedge funds with bullish positions and the average amount invested in these stocks was $10173 million. That figure was $1620 million in RDS-A’s case. Bank of America Corporation (NYSE:BAC) is the most popular stock in this table. On the other hand Pfizer Inc. (NYSE:PFE) is the least popular one with only 59 bullish hedge fund positions. Compared to these stocks Royal Dutch Shell plc (NYSE:RDS) is even less popular than PFE. Our calculations showed that top 15 most popular stocks among hedge funds returned 19.7% through March 15th and outperformed the S&P 500 ETF (SPY) by 6.6 percentage points. Unfortunately RDS-A wasn’t in this group. Hedge funds that bet on RDS-A were disappointed as the stock returned 10.3% and underperformed the market. If you are interested in investing in large cap stocks, you should check out the top 15 hedge fund stocks as 13 of these outperformed the market.